Compared to other Hollywood celebrities, Grace Kelly only played in 30 movies but the most impressive part is that all of them were filmed between 1950 and 1956. 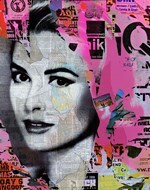 This makes it even more impressive how ChefDecor.com managed to assemble such a comprehensive collection of Grace Kelly posters. Before she married the Prince of Monaco, Grace dazzled the audience with her looks and acting skills, while leaving the impressive legacy of movies behind. For the first couple of years, Grace performed in TV series and made a name for herself, while attracting the attention of both movie fans and critics. Besides the High Noon posters, here you will find some more Grace Kelly art prints that acknowledge her other terrific performances. Dial M for murder and To Catch a Thief brought her back into the spotlight and with her role in Rear Window she ensured her place among the most respected Hollywood actresses. She decided to retire quite early, but even so, Grace played in enough good movies that she will be long remembered. Those who share this admiration now have an easy way to showcase it, by displaying Grace Kelly posters on the walls of their homes or offices.